As a keeper of marine aquariums for many years, one of the more interesting categories of animals I’ve encountered are Vermetid snails. They are not your typical snails, as perhaps can be seen from the picture below. In breaking down my aquariums for a move recently, I discovered some nice examples of shells from a larger species and thus felt it worth sharing my experiences with them. Vermetid snail shells sitting in a blue plastic lid that is approximately 2.5in. in diameter. The white spirals are Spirorbid worms (another filter feeding animal) that settled on the Vermetids. Adult Vermetids are filter feeders. The shells are anchored in the rockwork and the snail secretes a slime net to capture particulates in the water. Often the exist in an aquarium totally unnoticed, although large populations and adults of large species may cast visible slime nets. There are several common species of Vermetids in the aquarium trade, ranging in size from a few millimeters as adults to nearly 2 inches. Shell shapes range from an extended spiral as in the photo above to a more messy, spaghetti-like appearance. Vermetids start out as a regular free-roaming tiny snail. In fact, the are often confused for other snails like Cerithoids when they are in this phase. Although I had these snails in my aquarium for years, it took me a very long time to realize that the tiny conical snails that would periodically roam the glass were actually juveniles of the large Vermetid species I saw poking out of various rocks. Juveniles for smaller species can be nearly invisible due to their minuscule size. The free-roaming phase is actually quite easy to see in large specimens though, such as the ones in the photos here. It is the part of the shell that is “normal” before curling off in a crazy way. Once the snails find a spot in the rock to tuck in, they begin their lives as a stationary filter feeder. Free-roaming stage of shell highlighted in red. Vermetids are often a sign of a tank with a healthy ecosystem, as is the case for many filter feeders. Partciularly in smaller aquaria, obtaining high enough water quality without it being “too clean” (devoid of plankton and other edible particulates) is a challenge. Healthy populations of Vermetids often accomany populations of other filter feeders, such as small clams and mussels. Vermetids are typically harmless, although some exceptions involving corals and equipment are noted below. They are preyed upon by many crabs and some fish. Since they are often readily able to reproduce in stable reef aquariums, sustained populations represent natural food source for other reef animals such as hermit crabs and wrasses. Many people have these snails in their tanks and never know it. There are other animals that secrete slime into the water for various reasons, so it can be difficult to tell whether a trail of slime blowing in the water is a Vermetid feeding or something else. For the most part, Vermetids are just cool little animals that help filter your water and make the biology of the tank more diverse. Visible slime nets waving about in the water. This is an eyesore to some people, but more importantly it’s an indicator that you have way too much particulate food floating around in the water. Clogging filters, power heads, and other water circulation tubes and pumps. These animals LOVE to grow inside canister filters and pumps when space allows for it. The smaller species in particular can get into water circulation systems and clog up the tubes or even cause impellers to get stuck. Vermetids aren’t the only culprits for the second issue. 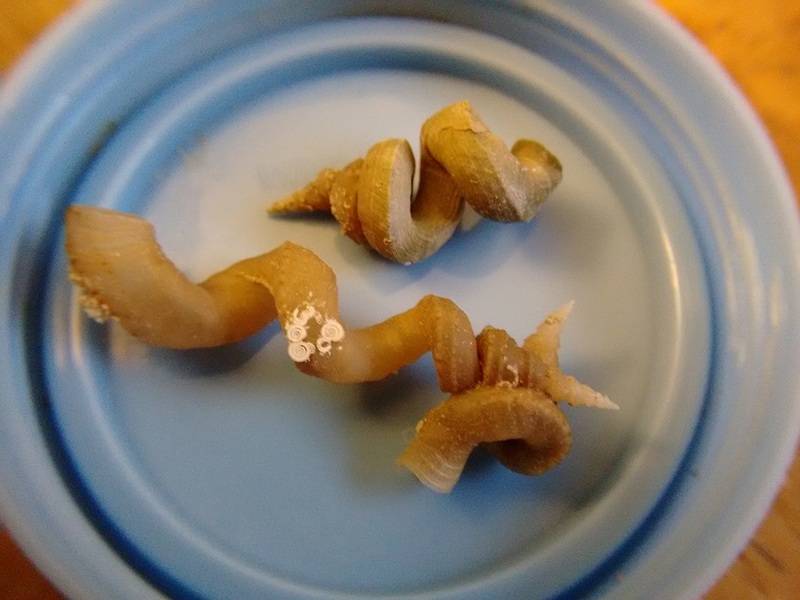 Many other filter feeding animals that produce calcareous shells cause the exact same thing, and typically when I crack open a piece of equipment that has been Vermetid-bombed, it is also full of these other organisms. Sometimes the populations have been so dense that the equipment had a continuous inner coating of shells that had to be chipped away to return it to its normal functionality. While I’ve had no really terrible problems with the smaller species of Vermetids, the larger ones have caused me some grief with something very particular: polyp bailout on stony corals. Large-polyped corals that secrete a skeleton will sometimes evacuate their skeletons in the event of sever stress or irritation, and the condition is typically fatal to the polyp (in the wild, some corals will send out free-roaming polyps to relocate and start a new colony, but drifting polyps almost never settle successfully in captivity). One year I had a series of inexplicable incidents of polyp bailout on several large-polyped stony corals. In each case, the skeleton contained a collection of tiny snail shells in the cavity where the polyps would normally be rooted. All were very much dead though upon discovery in the coral skeletons, which was a puzzle indeed. I initially thought this was some sort of parasitic snail that had been trying to feed on the coral tissue, but I had no luck with identifications and eventually gave up. Much later, after finally finding a complete shell of the large Vermetids pictured here, I discovered that the “parasites” that savaged my corals perfectly matched the free-roaming stage evidenced in the adults’ shells. Culprit identified! My best hypothesis for these repeated polyp bailout events with snails at the bottom has been that the free-roaming snails burrowed between the polyp tissue and the skeleton looking for a good place to live. Either they had been smothered by slime from the coral or the coral had secreted something else that killed them. Probably the irritation from this activity (and perhaps from the resulting decay) was too much and the polyps bailed as a last attempt at survival. It is worth noting that there were very heavy filter feeder populations in this tank, so the Vermetid populations were likely well above what would be found in the average reef tank. Should you find these unique snails in your tank, please take a moment to appreciate the beautifully weird convolutions of their shells and, if you can, leave them alone to live out their weird little existences. Dislodging them will almost certainly kill them – if not from breaking the shell, then from the fact that they will no longer be in a desirable feeding position when moved. In most aquariums they are totally harmless and interesting animals and problems generally only arise when you let them get a bit out of control due to too many particulates in the water. If you want to read more about Vermetids, Ron Shimek has a lovely article on them: Snails that Worm Their Way into Tanks.